This week has been jam packed with Olympics activities. I keep coming up with more ideas that I want to try and I can't believe our A Very Toddler Olympics series is almost over! Did you catch Jenae's Olympic rings clothespin relay yesterday? We also tried pool noodle hurdles! It was so fun. The pool noodle basketball activity I want to share with you today is easy and silly and not so perfect... but ended up being SO FUN... so I had to tell you about it. ^^ Ouch. Just look up. My pool noodle basketball hoop was definitely not perfect. However my goal today was to have fun and do Olympics activities with my kiddos... so the ugly looking basketball hoop worked just fine! This is a toddler activity so it is super simple. To create our basketball hoop we made each pool noodle into a circle and then we secured it in place with clear packing tape. Once we had five pool noodle circles then we stacked them together and used clear packing tape to tape them all together. The basketball hoop is NOT super securely stuck together but that is what makes it SO fun. 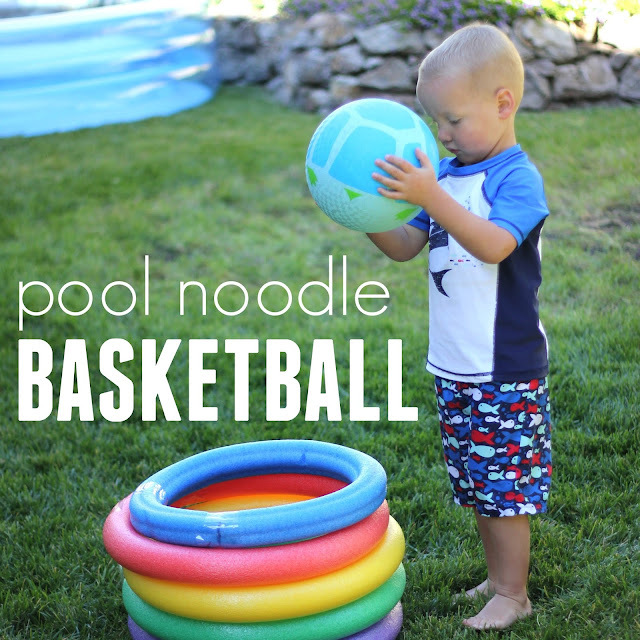 Once we had the noodles stacked we started shooting hoops. 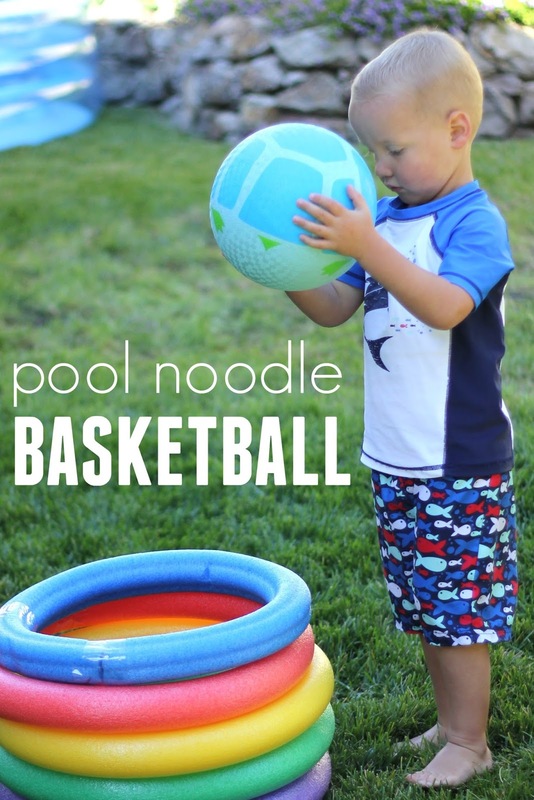 This is a toddler game so the hoops were more like little tosses or drops into the pool noodle basket. My son loved putting the ball on his head and then tilting his head forward to watch it drop into the bucket. It was adorable to see him laugh and laugh when he happened to make it in. He just pulled the ball out, tossed it in, and pulled it out again. Over and over again. After awhile the basket just imploded and pool noodle rings went flying everywhere. He had a good laugh and then we stuck it back together and played again. This simple easy activity reminded me that not every single toddler activity needs to be perfect and the things we make don't have to always look amazing in order to be fun. Jenae at I Can Teach My Child is sharing a toddler putting green game today so make sure to go check it out. You can find all of our A Very Toddler Olympics series activities HERE.